According to the American Heritage® Dictionary of the English Language, tether refers to a rope, chain, strap, or cord for keeping an animal within a certain radius. In the context of mobile technology, connecting a mobile phone to a laptop using a USB cable is called tethering. Tethering can be done using different media such as Wi-Fi, Bluetooth or USB. Tethering usually allows sharing of internet connection of one device to another. All modern mobile phone operating systems have tethering capability to share internet. Windows, Android and iOS have built-in features to allow tethering over USB, Bluetooth and Wi-Fi. When internet tethering is done via Wi-Fi, it is also known as a mobile hotspot. Fig. 1: Tethering refers to literally tethering your phone to the computer through USB to act as a USB modem. Fig. 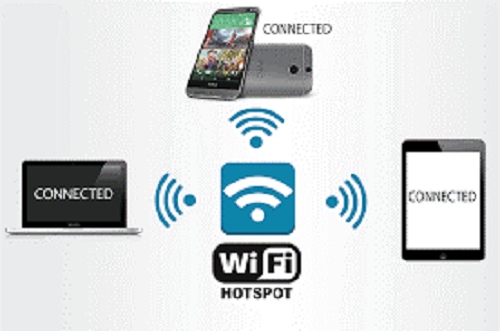 2: Hotspot is the act of creating a Wi-Fi network where the phone acts as a modem/router. Mobile hotspot is the most pervasive approach to tethering. It is easy to setup, and the presence of Wi-Fi modules on most devices makes it require no extra components. Tethering via Bluetooth is comparatively difficult to setup and also the speed is less than Wi-Fi. Currently, Bluetooth tethering is not often though it was common before Wi-Fi became widely available. Tethering over USB is very fast and power consumption is minimal as the device can be charged over USB. However, not many devices support this USB tethering capability. Also, it will need special drivers or software on both sides and probably some configuration stuff. Tethering usually uses NAT (Network Address Translation) to share internet. In this case, only the device that is connected to the internet (one which its internet connection is shared) has a public IP. Other devices connected by tethering have private IPs and the technique called NAT is used to identify different devices from the point of view of the single public IP. Mobile hotspots offered by various telecom providers consist of an adapter or device that will allow computer users to hook up to the internet from wherever they happen to be. Mobile hotspots are promoted as an alternative to the conventional method of logging onto a local area network or other wireless network from a PC. Although mobile hotspots could be used for other kinds of devices, they are most commonly associated with laptop computers, because laptop computers are a type of “hybrid” device that may roam, but doesn’t usually come with built-in mobile Wi-Fi. Apart from hardware, nowadays, software as well can create hotspots. Software such as Connectify Virtual Router® and also built-in tools in operating systems let you share internet by turning the Wi-Fi module on your laptop or mobile phone into a virtual hotspot. Another fundamental difference between tethering and hotspot is in provider models. Most telecom operators offering mobile hotspots sell a box or adapter for a fixed price, and offer the mobile hotspot service on a monthly basis. With tethering, the offer could involve simple cable connectors to hook up an existing mobile wireless device to a laptop, without any monthly charge. However, mobile hotspots seem to be a popular option because of convenience. When you have the option of using either one of these services, you may want to consider the potential costs involved. If you use tethering to access the internet, you may have to pay for each kilobyte of data that is transferred over the cellular network. If you use the internet frequently, this could amount to a large monthly bill on your cell phone. By comparison, with a traditional hotspot, the internet can be used as much as you want without having to worry about the amount of data that you are accessing. The owner of the hotspot will pay a monthly service fee to the internet service provider. Typically, a mobile hotspot doesn’t come with contracts and fees. The best ones are pay-as-you-use, so you only pay for the data you use, and refill when necessary. The carriers with the best coverage and speed (Verizon Wireless, for example) are usually the most expensive, and may demand a contract. The ones with the best prices and value (Karma, FreedomPop etc.) sometimes suffer less-than-stellar coverage and speed. Wi-Fi hotspots are found in public places as well as private places. Today many public places in the world such as airports, stores, restaurants, hotels, hospitals, libraries, public payphones, train stations, schools and universities have hotspots. Many provide free access to the internet while there are commercial ones as well. Hotspots can be setup at home as well by simply connecting a wireless router to the internet via ADSL or 3G. This is the most pervasive method used these days to share the internet connection at home across various devices. As a technology offering, mobile hotspots have multiple advantages over tethering. Data bandwidth: When involved in work that consumes a lot of data bandwidth, you may land in a situation wherein you exceed the data transfer limits. Using a hotspot is one of the first options in this scenario. Phone’s battery life: Using a hotspot means never draining your battery just because you needed to get some work done. This comes with the benefit of better long-term usage, since you’re not taxing your phone just to stay connected. Using multiple devices: You can reliably tether multiple devices. While you can tether multiple devices to your phone, the more you add, the worse the experience usually is. While most hotspots will put a limit on the number of devices you can connect, you can always connect more than one or two without performance problems. Work continuity: Tethering is prone to frequent call drops especially when used over long. This is usually attributed to the firmware used. Likewise, even “unlimited” data plans—depending on carrier—get throttled after a certain point. Hotspots have greater reliability with the added advantage that you pay-as-you-use. Choosing between data and voice: This varies by carrier, but with Verizon Wireless and Sprint, tethering (via 3G, not via LTE) conflicts with talking on the phone. Although the phone may ring, data would be disconnected the moment you answer it and vice versa. Diversifying carriers: Frequent travellers have the option of whichever carrier offers the better service where you roam. Even if you’re at home, you now have the option to pick the carrier with the best performance, or switch off when you need to. Ashok Kumar. "Difference between Tethering and Hotspot." DifferenceBetween.net. November 13, 2018 < http://www.differencebetween.net/technology/difference-between-tethering-and-hotspot/ >. I have a query. I am using bluetooth tethering, through my one android phone to another android phone and i am using free VPN app on my second android phone which is connected by bluetooth tethering to open Facebook because it’s blocked. I am using my company’s WiFi network to connect to internet. Can IT department of the company trace that i am using bluetooth tethering on my second android phone through my first android phone and using Facebook. No. Your company network team can only know your primary mobile’s MAC Address and the IP address it connects to – in this case the VPN Address. I am trying to tether to my desktop via USB. The tethering works in that I can get online, but a lot of sites – such as my email – give a security error and won’t let me log in. Other sites, such as Pandora works just fine. How can I fix this?